U.S. Secretary of Education ROD PAIGE, author of the “No Child Left Behind Act,” advocates school choice at the ARCO Forum last night. U.S. Secretary of Education Rod Paige made his case for school choice to a divided crowd of skeptics and supporters at the ARCO Forum last night. In 2001, Paige drafted the Bush Administration’s major initiative on public education, the “No Child Left Behind Act,” which allows parents to choose schools for their children and cuts funding from schools with dwindling enrollments. Paige likened a successful school district to a business. Few tangible improvements have been made to K-12 public education in the U.S. since the famous 1975 report on the problems in the American educational system, entitled “A Nation At Risk,” Paige said. 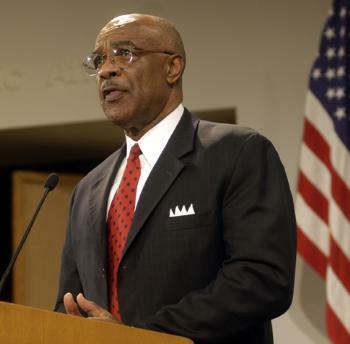 Paige, the first black Secretary of Education, has served at various points in his career as a teacher, coach, school board member and superintendent of the Houston school district—the seventh largest in the country—before assuming his current position in January of 2001. By “embracing choice,” he claimed, the public school system in Houstonitself became the top choice for most local families. Several audience members openly criticized various points of Paige’s argument for the No Child Left Behind Act. Students from the Graduate School of Education said that the plan would hurt students whose parents do not take an active interest in their childrens’ education. After the question-and-answer period, Paige reiterated his reasons for creating the No Child Left Behind Act.